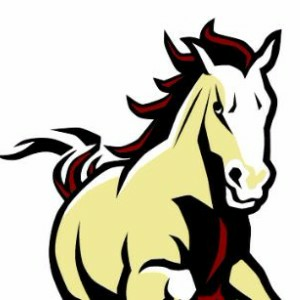 5th Grade Preview Night Scroll down! 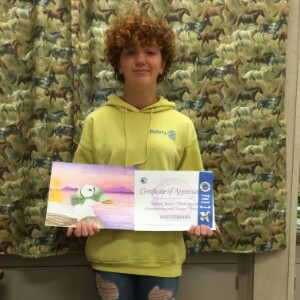 Rory F -received Young Artist Award from the Federal Junior Duck Stamp Contest for her beautiful colored sketch of a Spectacled Eider. Her work is pictured below. Natalie C. won an honorable mention in the same contest. We are proud of our young Mustang artists! 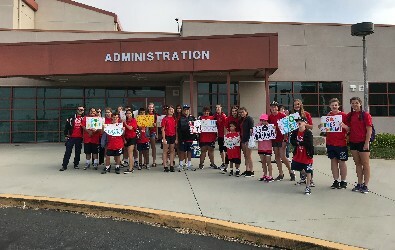 Our Special Olympics athletes left for competition today with the support of our entire campus to cheer them on for this exciting day and gave them a rousing send-off as they got on the bus. These athletes have been training and getting ready for this event for months. 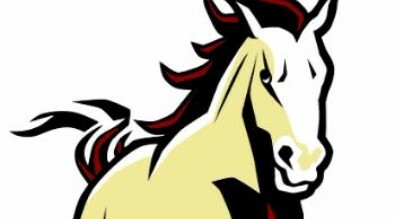 Good luck today and Go Mustangs! Here's link to more information. Run with the Mustangs 5k Success! 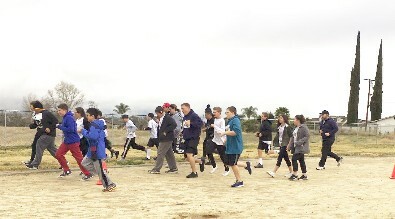 Saturday, April 13, MVMS held it's annual 5k race. Over 100 runners participated in the race on this beautiful spring morning. Thanks so much to PTSA for organizing this great event, and to Mrs. Pennino's class for creating the run t-shirts all participants received. 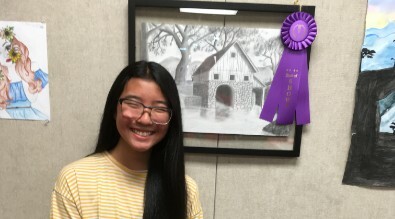 2-Dimensional: 1st: Rory F. - Grist Mill Sketch; 2nd: Jamie L.- Portrait of a Girl; 3rd: Delanie T.-Metallic Building - Painting; Honorable Mentions: Alyssa S.; Hailey A.; Delanie T.; Lida P.; Iliana S.
3-Dimensional: 1st: Esther Z.-Mailbox Sculpture; 2nd: Rory F.-Paper Mache Mask; 3rd: Leah B. - Fish Pond Clay Sculpture. Honorable Mentions: Gabriel D.; Chloe W; Tanner M.; Keith K.
Photography: 1st: Mia G. - Baby in Flowers; 2nd: Trevor S. Arizona Vacation; 3rd: Maddie P. Bryce Canyon;. 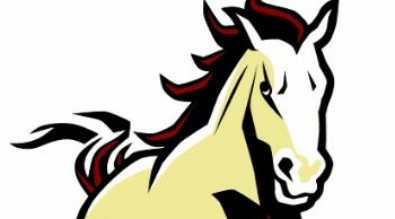 Honorable Mentions: Giovanni C. (2); Mia Gomez (2); Maddie P.
Congratulations to our talented Mustangs! 5th graders visited campus on Wednesday, April 10 to tour the campus and see what life at middle school is like. In the evening, parents and students were invited to an information night that included our Band Concert and our Annual Art show. Thanks to the WEB leaders and all the staff that put together a great day of fun and information. 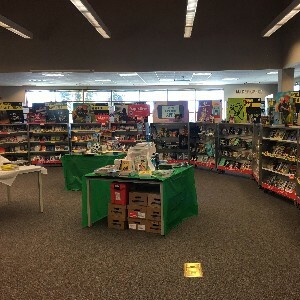 Mesa View's annual book fair is here! It will be from March 4th - 8th. Books for everyone, even adults! ONLINE ORDERING will began February 27! 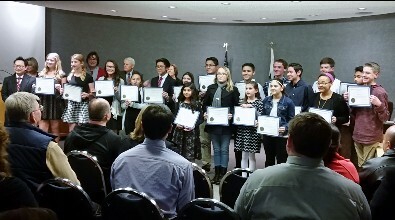 Students that were accepted into the all-county honor band were recognized at the school board meeting this past Tuesday. These students, led by Mr. Kane, have worked very hard, and exemplify all of the qualities that we strive to uphold as MVMS Mustangs. This past year, Mesa View had more students accepted than any other school - elementary, middle, or high school - across the entire county. Why? Bring your family and join Mr. LeVan, Mr Bennet, and their friends to compete with your family in a mystery STEM challenge, complete with fun and prizes! Prepare for a great evening of building and laughter! 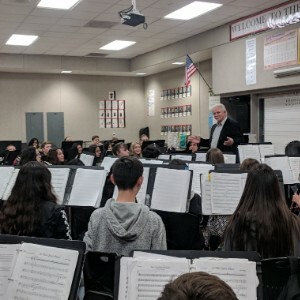 On February 14, 2019, Mustang Band students had the chance to work with Dr. Eddie Smith, Director of Bands at the University of Redlands. 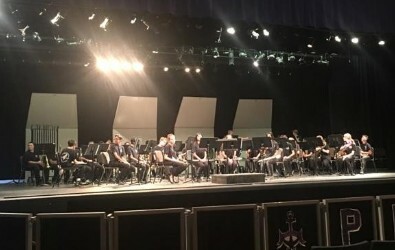 Dr. Smith regularly works with some of the best high schools in the area, and we were able to benefit greatly from his insight as we prepare for festival season. 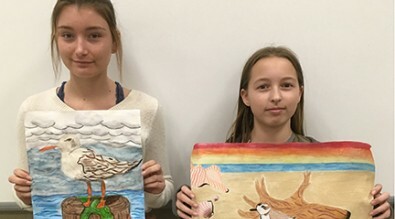 The following two students, Delanie T. and A. just entered the California Coastal Art & Poetry Contest. They are both quite talented. We are wishing them great luck in the contest! 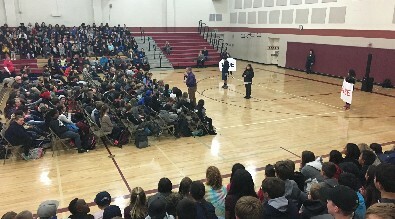 On Tuesday, 1/29/19, our 8th graders and 8th graders across our district, had the opportunity to hear speakers from a wide variety of career occupations . Students got a look at what the jobs entail, and they were able to see first hand some of the tools and equipment used by some of the professions. Thanks to the Rotary Club, and Mrs. LaFourcade for putting this together! Starting Monday, January 28, 2019, we will have a buzzer at our front door. When arriving at the front door, simply ring the buzzer and state your name and reason for your visit. The office staff will open the door for you. This is a measure to ensure the safety of our students and staff. Thank you for your support. A partir del lunes, tendremos un timbre in las puerta de entrada. Cuando llegue a la puerta principal, simplemente toque el timbre e indique su nombre y el motivo de su visita. El personal de la oficina le abrirá la puerta. Esta es una medida para garantizar la seguridad de nuestros estudiantes y personal. 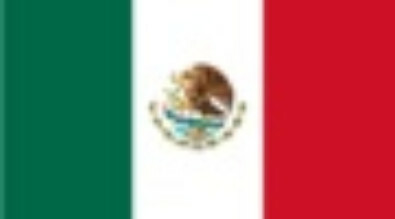 Gracias por su apoyo. 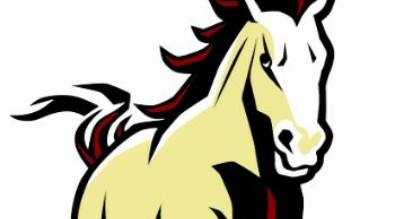 Mustang 5k T-Shirt Design Winner! 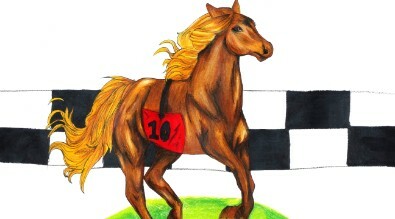 Congratulations to Alyssa S. for designing the winning T-Shirt for this year's annual Mustang 5k Run! Alyssa won over dozens of designs and we can clearly see why with this beautiful image! 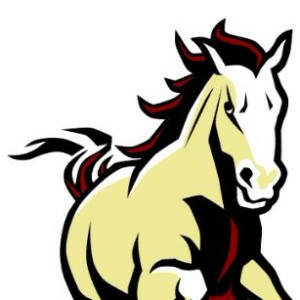 The Mustang 5k will be on Saturday, April, 13, 2019. Registration form is HERE. Also a Sponsor Letter HERE. Looking Ahead for 8th Graders! 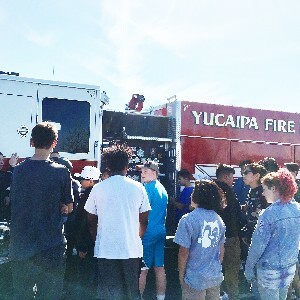 8th graders will have opportunities for exploring what's to come at Yucaipa High School. Read below for these Important dates and events! YHS 9th Grade Preview Day: Wednesday, February 5, 7:45 am - 11:45 am. All 8th graders will be bused to YHS for a tour and a sample of high school life! YHS 9th Grade Registration: Monday, February 13 - all day @ MVMS. Students will meet with YHS counselors during their Social Studies classes. Be sure all registration forms are filled out and brought to school for that special meeting day. 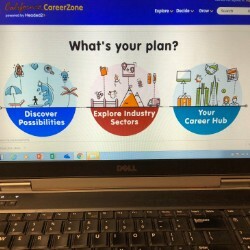 On Wednesday, all of Mesa View's 7th grade students participated in an online career exploration activity utilizing the web page California Career Zone. Students were asked a series of questions to help them determine the lifestyle they want to lead and how much it will cost them. They then explored occupations that might support that lifestyle. Ask your student what their minimum annual salary will need to be to support their lifestyle, you might be surprised!! Last week was Kindness Week here at MVMS. Students had activities all week long, including "Kindness Bingo", making cards for kids in the hospital, putting encouraging messages on the Kindness Tree, and culminating in our big Rally. At the Rally, teams were done by grade level, and they competed in a variety of games, while their classmates cheered them on. Our sports teams and parents who have contributed were also recognized. The band entertained everyone and did a great job! Congratulations to the following five students for being selected to attend the PRYDE Leadership Camp held the weekend of November 17 & 18 in Crestline. 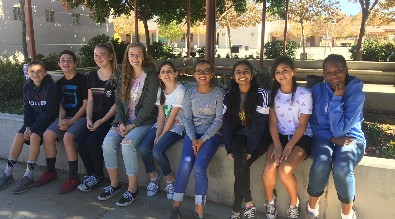 PRYDE is a leadership camp sponsored by the Yucaipa Rotary Club and these Mesa View students went through a competitive process to be selected. Congratulations to Rhett B., Rebecca C., Kennedy C., Rory F., and Braidi N.! 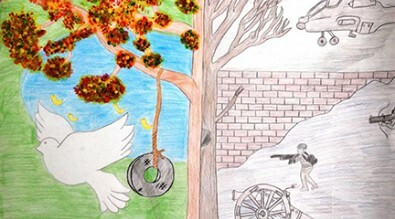 The Yucaipa Valley Lions Club participated in the International Peace Poster contest. Lida P. of MVMS won First Place at the Club and District levels! The contest theme this year is "Kindness Matters". 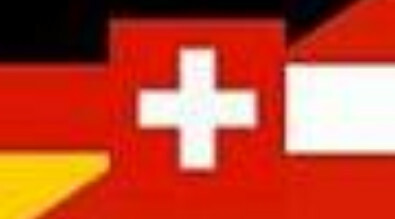 The winner of this international contest will recieve $5000. Congratulations Lida! Fun was had by all on our first STEM Family Challenge Night! The Mystery Challenge was a marble maze and the winners had a phenomenal score of 20.5 seconds! Look forward to another Challenge Night in the Spring! The Grist Mill sketch is based on T.V. Art Instructor, Jon Gnagy's book lessons. He is the artist who had the greatest influence on my life and Mr. Bennett met him twice. The lesson incorporates one point perspective, highlighting, shadows and American ingenuity. It is a lesson in early technology- a true STEAM Lesson. If you are interested in this afterschool program, please see the flyer for hours and rates. You can contact the program coordinator at the number listed on this flyer. 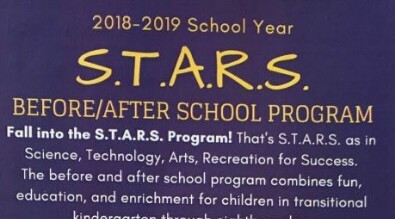 This program is not run by the school but by an outside organization and is available to all students. Congratulations to the Mustang Robotics team, Rhett, Scott, Brook, Ben, Tuck, Rowdy, and Jacob for their 1st place trophy in Core Values at the FLL Qualifying Tournament on Saturday. The Robotics Team had a virtual guest speaker On Tuesday, October 30 to talk to them about Life in Space. Their speaker, Caroline, is a former flight control operator at NASA, she did some project mentoring with the students. 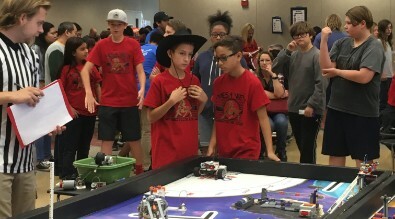 On Saturday, October 27, MVMS hosted a scrimmage for the Robotics teams competition. 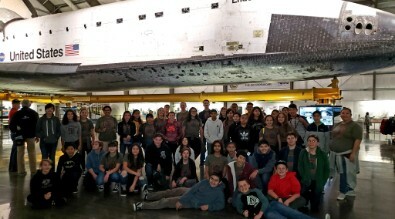 We had 16 teams and over 200 people here from as far away as Hemet and San Jacinto, as well as local teams from CES and PVMS. The competition will be held on Saturday, November, 3 at UCR. 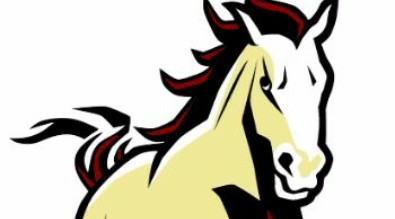 Go Mustangs! It's that time of year again! Mesa View is hoping we will have another one of our students selected for the prestigious Carson Scholarship! The Carson Scholarship seeks to recognize and reward outstanding students in the United States who have exemplified academic and humanitarian qualities. Recipients will receive a $1,000 scholarship. Any student at Mesa View interested in being considered for the Carson Scholarship should see Ms. LaFourcade in the Counseling Office for application details. 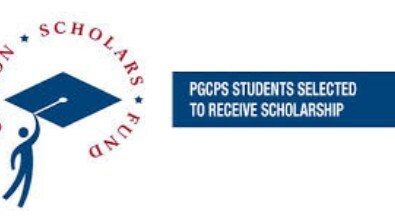 This scholarship is open to grades 6, 7, and 8. It's never too early to begin applying for scholarships. Don't miss out! Applications Due November 8. Our partnership with Verizon and CSUSB for the Verizon Innovative Learning program offered a great field trip to CSUSB for our students. 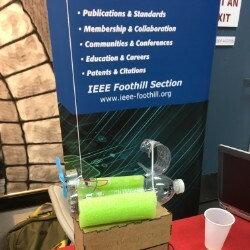 The trip included a tour of the campus, interviews with students from different STEM majors, a discussion about Climate Change offered by the League of Women Voters, a tour of the Innovation Lab including time with VR, 3D printing, and circuits. 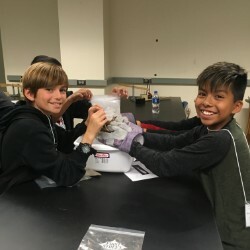 Students also visited a university chemistry lab and created 'comets' with dry ice, liquid nitrogen, ammonia, and some space debris in the form of corn syrup. T-Z 3:30 - 4:30pm. Any 5:00-6:30pm. Come out and support a local award winning organization! The Mesa View Middle School Band and Choir invite you to a spaghetti dinner at Clarkies Diner in Calimesa on October 19th from 4:30-7:30 PM. Tickets are only $10 and can be purchased at the door. Click here for details. Your meal will include Salad, Spaghetti (Vegetarian Option Available), Garlic Bread, Cinnamon Streusel Cake and a Soft Drink. You may also take your meal to go (drinks not available to go). MVMS Band and Choir receives 60 % of proceeds from this event. The award winning Mesa View bands and choir will be having their first concert of the year this Wednesday night, October 17. The performance will begin at 7:00pm in the gym. These hard working students are looking forward to showcasing their progress and would love to see you there! 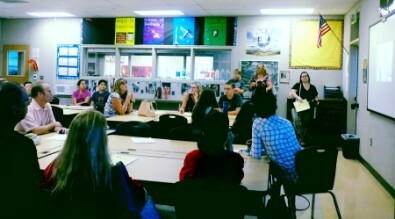 Our Career center has been bringing in speakers to a packed audience. Students can come in at lunch to hear about a variety of careers and get some first hand experience. Friday, October 5 was Jersey Day. 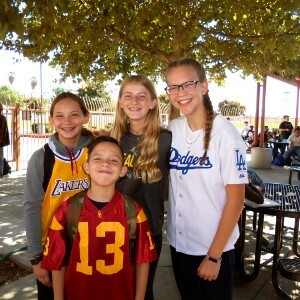 Students and staff were invited to wear the jersey for their favorite teams! 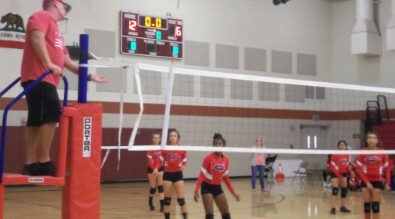 Our Volleyball and Football teams' season is almost over! Be sure to come out and cheer for your fellow Mustangs as they work hard to get the win for our school! Last week, students held a Club Rush during both lunches to promote this year's club activities. 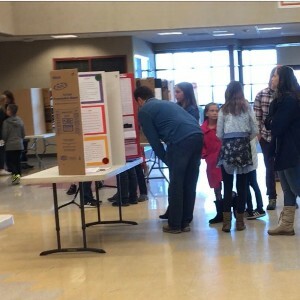 A variety of clubs were represented so students could ask questions and decide what interested them. Most clubs are still accepting members, so check the bulletin and website for meeting days and get involved! "Is your 8th grader planning to go to college after high school? If so, the PSAT8 is a great opportunity to make sure they are on the right track. Registration and payment are due by Friday, September 7!" Click HERE for the link, or see the Information Flyer in the block above. 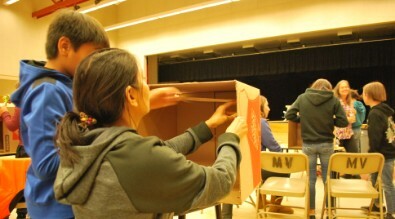 Student council campaigned last week for class officer elections. Nominees made posters and other campaign materials, and then on Thursday, August 23, gave their speeches to the general student body at lunches. Congratulations to: 8th Gr. President: Ethan M.; VP: Jayne F.; Secretary: Natalie W.; Treasurer: Sammi B.; Sports Commissioner: Arianna L. 7th Gr. President: Hannah E.; VP: Jack J.; Secretary: Alyssa O.; Treasurer: Kaylee L. Sports Commissioner: Jake G.
The 2018 Back To School Night was held on Wednesday, August 15. The WEB leaders gave a special presentation for 6th grade parents, and all classrooms were open for visitation and a brief orientation to their curriculum for the year. Thanks to WEB and Student Council for assisting. Great job everyone! 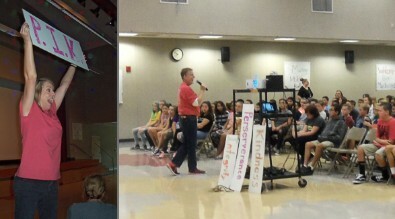 The action packed Welcome Back Assembly was held on Friday, August 10.! Students met our Interim Principal, Mr. Donohue, and had fun learning about Mesa View's PBIS expectations and new slogan - "PIK the Mustang Way"! PIK stands for Perseverance, Integrity, and Kindness. 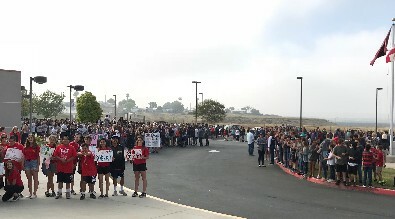 During the rally student's showed their school spirit, won Mesa View apparel, and viewed an entertaining video showcasing how to "PIK the Mustang Way". We're looking forward to our students showing perseverance, integrity, and kindness everyday, both in and out of the classroom! 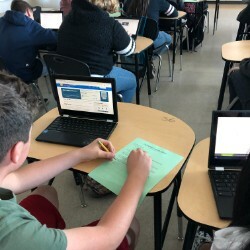 Students were to choose an endangered animal, based on their group research project, and create a PSA (Public Service Announcement) to bring attention to the public the needs of the animal based upon their findings. 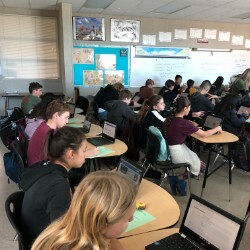 7th grade History classes participate in a variety of activities to bring the Renaissance to life. 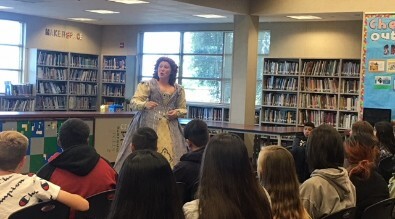 Each day is a different activity and include presentations by "Queen Elizabeth" (pictured), a period blacksmith, MIlitary demonstrations, "Sir Francis Drake", and other in-class activities. 6th graders in Mr. LeVan's class ran a popcorn business all year and chose to donate $500 of their profits to the Jeans for Genes fundraiser in support of the Cystic Fibrosis Foundation. These donations were accepted on the Foundations behalf by Mrs. Wendt, a teacher at MVMS. We are proud of our Mustangs for such a generous and caring donation from their hard work! Go Mustangs! 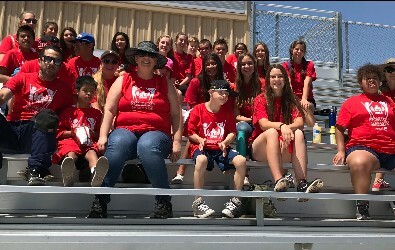 Students from Ms. McMurtrey's class were cheered on by the student body as they prepared to leave to participate in the Special Olympics Regional School Games at Beaumont High School. Students will participate in a variety of track and field events. 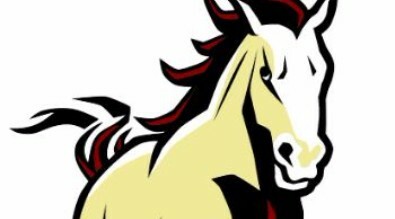 Go Mustangs! MVMS Band and Choir Excel! 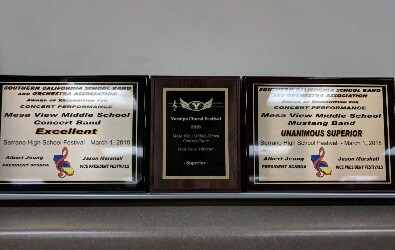 The Mesa View bands and choir have had a very successful past two weeks. 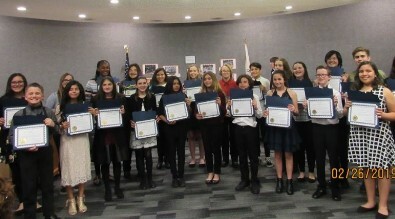 All 7th and 8th grade students participated in at least one festival hosted by various organizations throughout southern California. Ensembles prepare 3 pieces of music and perform for a panel of judges. The judges listen to the performance and provide both written and recorded feedback which we will use to further improve throughout the year. The bands also have to perform a piece of music they have never seen before. We are given 4 minutes to talk through any potential pitfalls, and then we perform. This is like the equivalent of learning a new dance routine that includes between 20-50 dancers with only 4 minutes to prepare. The Concert Choir received a rating of "Unanimous Superior" and a score of 74.5/80. The Concert Band received a rating of "Excellent" at 2 festivals they attended and were just shy of "superior". 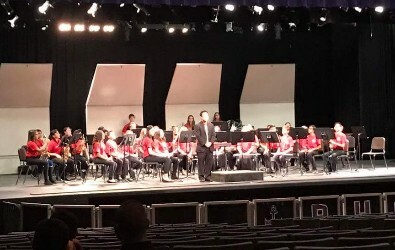 The Mustang Band received a rating of "Unanimous Superior" at 2 festivals. This ensemble has received this award at the last 7 consecutive festivals meaning they have received the highest ratings possible from every adjudicator (over 26 in total) that they have played for in the past 2 years. To this day, this is the longest streak of any band in the district. Congratulations to our Musical Mustangs!! Future Mesa View families! 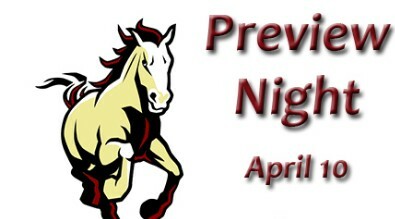 You are invited to attend our Preview Night and Honors Information Meeting, April 10, 2018. The program begins at 5:30 p.m. in the Mesa View MPR. This evening is specifically for our incoming Mesa View families. At 5:30, the award winning Mesa View band will be performing,followed by an overview of life at Mesa View at 6:00. At 6:30 p.m. we will begin our Honors Information Meeting for any families interested in enrolling in Honors classes for 6th grade. Also, beginning at 6:30 is our Art Show where you can view some of Mesa View’s amazing student art work. We hope to see all of our future Mustangs April 10 at 5:30 p.m.
On Wednesday, March 7, the Fire Department conducted a program for students in our Accelerate Program to demonstrate the duties of being a firefighter. Students were given an opportunity to experiences everything from trying on gear, to exploring the engine and running the sirens. Thanks to our great first-responders for showing our students a little slice of their possible futures! Book Fair has begun! 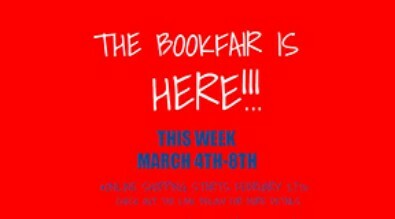 Tomorrow the book fair will be open all day from 7:30 - 3:30 TUES - WED- THUR and from 7:30 - 1:30 on Friday. There are lots of great books, gift items and fun things to purchase. All proceeds go to the PTSA to help pay for the assemblies, activities and field trips that you enjoy. Please come and purchase some to help out Mesa View, and get a good read in as well! 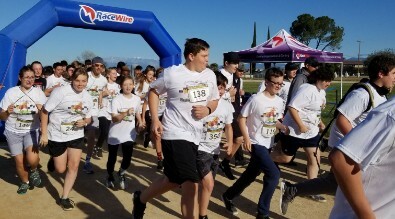 Mesa View held it's annual Mustang 5k Run to raise funds for supporting students here at school. The PTSA worked hard to put on this event and everyone enjoyed the activities prior to the run. Thanks to everyone who worked to make this event a huge success. 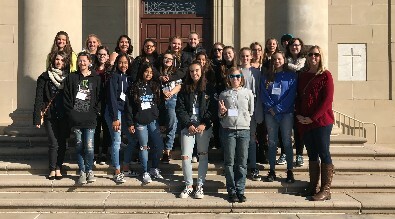 Mesa View 8th grade girls had an amazing day at the University of Redlands attending a conference focused on STEM careers. They participated in workshops presented by women who have STEM careers and heard from an amazing motivational speaker. 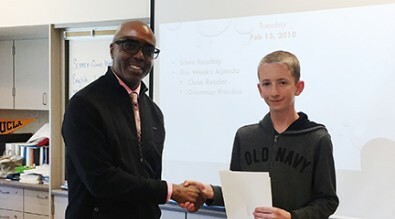 Congratulations to William S. for receiving a certificate of excellence signifying he was among the top 10 percent of applicants for the Spirit of Prudential Community Award in the state of California. William also received the President’s Volunteer Service Award recognizing the significant amount of time he has spent volunteering in his community. William was presented with a signed letter and certificate from President Trump recognizing his dedication to volunteering in his community. 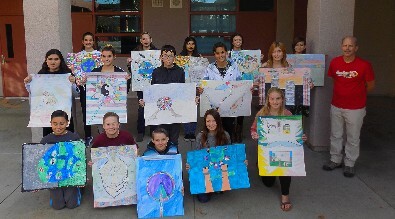 The local Lion's Club held their annual poster contest. Shown are the entrants. The winner was Evelyn M for the Yucaipa School District. From left to right: Front Row - Gregory C., Colin T., Derek D., Lexie F., Amber B.. MiddleRow - Inez W., Cariann T.,, Dillon P., Ethan M., Delanie T,. Instructor: Mr. Bennett. Back Row - Elizabeth E., Haley K., Evelyn M., Lida P., Avada G. Well done Mustangs! Mesa View honored outstanding students on Friday, January 19, for it's mid-year Awards Assembly. 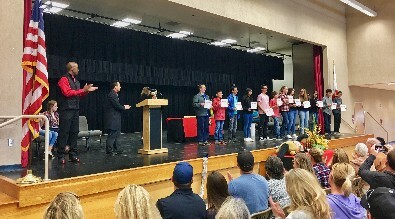 Students who earned awards for Academic Achievement, Citizenship, Band and Art were recognized before parents and their peers. Congratulations to our best Mustangs! Boys and girls basketball season is underway here at Mesa View. 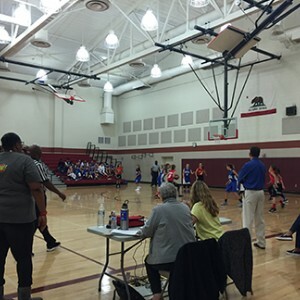 Girls and boys teams practice two to three days per week and it's been a fun run against other middle schools in our league. Currently the Girl's team is ahead 2-0 games. The8th Grade Boys are neck and neck at 1-1 games. The 6/7 Boys are currently behind at 0-1. Keep up the hard work, players, and finish strong! 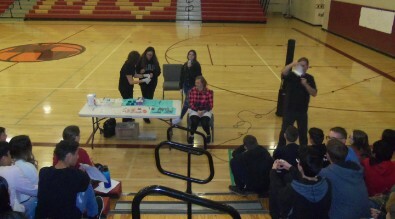 Tuesday, January 9, an assembly was held in the gym for all students. Discussion of both internet/social media safety and responsibility online was presented in an entertaining manner that engaged students. Congratulations to the following nine students for being selected to attend the PRYDE Leadership Camp held the weekend of December 9 & 10 in Crestline. PRYDE is a leadership camp sponsored by the Yucaipa Rotary Club and these students went through a competitive process to be selected. Congratulations to Leilani A., Peyton B., Shayla C., Spencer F., Griffin H., Phoebie M., Rudra P., Maddie P., and Me'Kya Y! Please support us when you shop on Amazon. Go to smile.amazon.com/ch/91-2154884 and Amazon donates to Mesa View Middle School PTSA. Thank you and happy shopping! 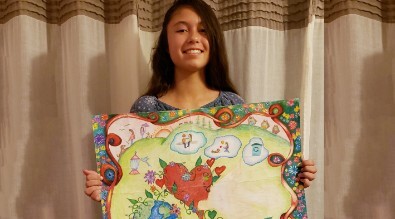 The winner of the 2017-18 Lion's Club Peace Poster Contest for the local area of Yucaipa/Calimesa School District is Evelyn M.. Her winning design will go on for future judging - county, state, U.S., and world. Congratulations to our Mustang! Last week, we received 86 Natural High essays and were amazed at how our students believe in the power of staying drug free and put their energy and focus into their Natural Highs. Thank you to all of our students who entered the essay contest. Congratulations to our Natural High essay contest winners. River P., Me'Kya Y., and Piper S. wrote the winning essays and received Starbucks gift cards! Click on their name above if you’d like to read about their Natural Highs. Congratulations River, Me'Kya, and Piper! Robotics Team Goes to the Qualifying Tournament! The Robotics team participated in the first scrimmage of the year on Saturday, October 21, here at MVMS. They worked hard for weeks prior to the event and earned the right to go to the Qualifying Tournament in Riverside on November 4th. 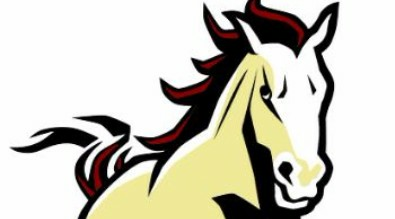 Go Mustangs! 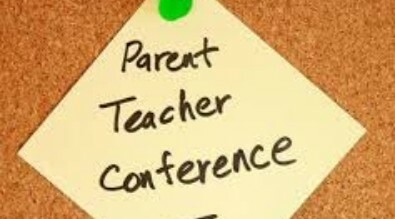 Parent Conferences were held on Tuesday, October 17, and Wednesday, October 18 for all parents to attend and discuss their child's progress. 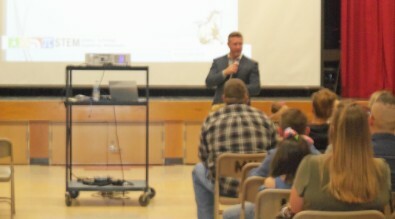 Thanks to the teachers and staff that made this event run smoothly and to the parents who came. DJ Party Tons of Fun! Students who sold enough of the Cherrydale fundraiser items were treated to a fun DJ party on Thursday, October 19, in the MPR. Food, drinks and games along with cash prizes were part of the fun. Thanks to all the students who sold and contributed to the PTSA's fundraiser. MVMS thanks you! 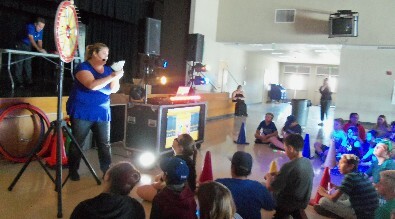 With over 200 hundred people in attendance, all enjoyed the variety of acts that were performed on Friday, October 6. After some difficult deliberation, the judges determined the winners. 1st Place: Malauna T., 2nd Place: Hailey S., 3rd Place: Frankie J. Congratulations winners! Thank you to Mr. and Mrs. Labrada, Ms. Williams, PTSA and all the volunteers who helped! Students in Mr. Bennett's Art classes had their work displayed in the District Office Lobby and Board Room. These art projects were the best of the best, and will be on display for the next few weeks. Stop by and have a look! Club Rush at Lunch This Week! 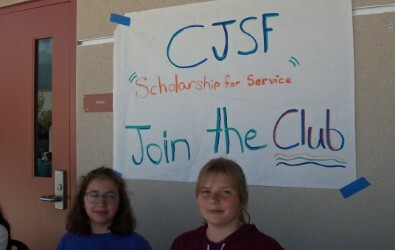 Clubs held sign ups at lunch this week. Clubs to join include: Video Game Club, Anti-Bullying Club, MakerSpace, Garden Club, Builders Club, Rotary Club, Olympia Math Club, The Ride Club. Signups were at Lunch on Wednesday, September 13, and Thursday, September 14. The first dance of the year, was a huge success! Hawaiian was the theme of the evening and was embraced by staff and students alike. Special thanks to Student Council and all chaperones for making it a night to remember! 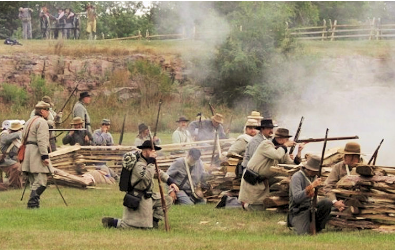 There are TWO 8th Grade History field trips available this year and you can go to both! 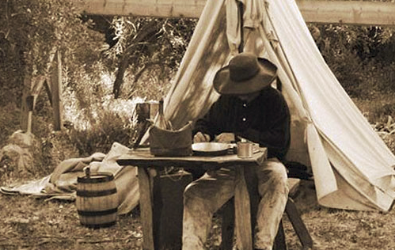 Gold Rush Adventure, on March 7, 2018 and Civil War Day on May 10, 2018. Permission slips were passed out in history classes today, August 25, 2017. Cost is $30 for each trip, for both students and chaparones. You must have TWO permission slips if you want to go to both. Money must be turned in my September 6, 2017. 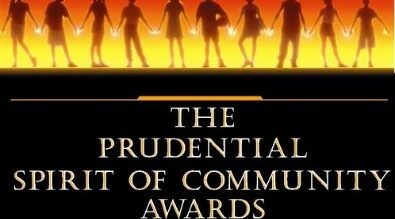 Attention Mesa View Students: If you've made a difference volunteering over the past year, you could win $1,000 and a fabulous trip to Washington, D.C. by applying for a Prudential Spirit of Community Award. Even more importantly , you would win recognition that might inspire your friends to follow your example. These prestigious awards have honored more than 100,000 middle and high school students over the past seventeen years solely for their volunteer work. If you are interested, please see Ms. LaFourcade int he Counseling Office. 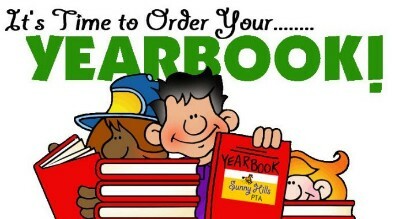 IT's time to order your yearbook! The early bird price is $45. Price will go up in January so get yours now. Yearbook ads are also available for purchase, space is limited so order early. We sell out of the yearbook every year, so don't wait until the last minute and miss your opportunity to get your 2017-2018 yearbook. 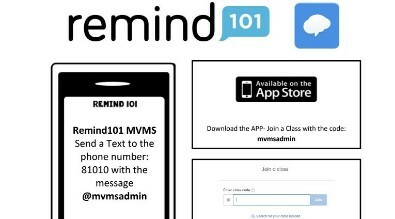 All students, MVMS Staff, parents and community members that want to be updated about important school events, can join our Remind 101 messaging group. You will get text notifications about these events. Just text to 81010 the message @mvmsadmin. It will automatically enroll you. Some teachers are using this for their individual classes as well. So check with your child's teacher for the access code. 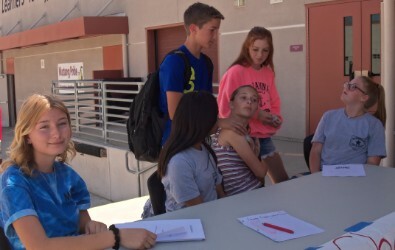 7th and 8th grade Student Council held their annual elections this week. Campaigns ran all week and speeches were given at lunch on Thursday. 7th Grade Winners: President Lea M.; Vice Pres. Jayne F..; Secretary: Bella D. Commissioner of Sports: Phoebie M.; Treasurer: Shantal. 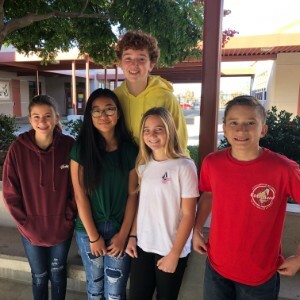 8th Grade Winners: President: Avai O.; Vice President: Alanna T.; Secretary: Jordyn T.; Commissioner of Sports: Brinley T.; Treasurer: Lauren P. Congratulations to our elected officials! Need a quiet place to finish your homework? Need help with your homework? Homework Center starts on September 5th,after school. It meets in Room C101 for 7th & 8th and D112 for 6th and will be open from 2:15 - 3:15 every Tuesday, Wednesday and Thursday. Some computers are available as well. Students must sign in by 2:20, and must stay the entire time unless a parent comes to the door to pick them up. Come to Homework Center and get your work done! 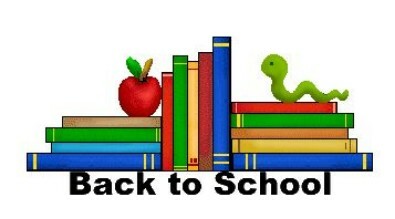 Back To School Night is on Monday, August 14, at 6pm. Yearbooks are already on sale. We sell out every year, so get yours soon! Mesa View's 6th Grade Honors classes have worked hard over the last several months running a popcorn business, selling after school. The classes contributed over 75 percent of their profits from their popcorn business to charitable organizations. On Friday, the class Board of Directors presented a generous donation to Childhelp of Beaumont. Way to go Mustangs! Jordyn T. was inspired, after a discussion in her Student Council class, to create RAK Bags (Random Acts of Kindness) for fellow students in need. She designed the bag and purchased products to create bags for both boys and girls. Her project was chosen to be implemented and the RAK Bag Committee spent this week putting together approximately 50 RAK Bags to be handed out to students in need on our campus. Carson Scholarship Winner 2017 - Kelsey C.
Congratulations to Kelsey C. for being named a Carson Scholar! Once named a Carson Scholar, students are awarded with a $1,000 college scholarship and recognition package. The Carson Scholars Fund announced that 483 of the best and brightest academic superstars from across the country have been named Carson Scholars and Kelsey is one of them! Kelsey was nominated by Mesa View based on her high academic achievement and commitment to the community. Carson Scholars are role models and represent our future leaders. Congratulations also go to Matthew F. for being a Recognized Carson Scholar! Matthew received the honor of being a Carson Scholar last year and this year was selected as Recognized Carson Scholar, an honor that can be renewed each year for a Carson Scholar recipient. Congratulations to both Kelsey and Matthew, we are proud of your achievements. 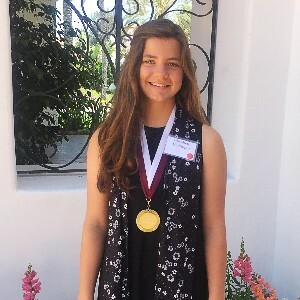 Elisabeth (Lily) E. is the Mesa View STEM student of the week for her winning science fair project, “Firescape” which will be competing in the county science fair. “Firescape” explores what plants that can be used in landscaping are the most fire resistant. Lily is a talented artist and offers assistance to anyone who asks for it. Her art is usually showcased during school art shows. She is a member of the Builder’s Club, the middle school version of Kiwanis, and designed the club t-shirts. Lily volunteers in the special education classes because she loves giving back to the community. She is also an avid athlete playing volleyball, basketball, soccer, and she has been practicing aerial gymnastics since she was three. She would like to perform with a circus someday. Her teachers describe her this way: Lily is a fervent learner and what we love most is that she is transparent in her learning where she shares mistakes she has made and what she has learned from those mistakes...such a benefit for students around her!! 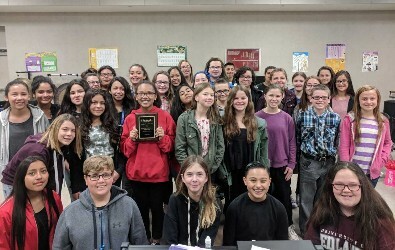 Both the MVMS Concert Band and MVMS Mustang Band, under the direction of Mr. Paul Kane, participated in SCSBOA festival hosted at Pacific High School. They are given ratings from 4 separate judges that address their overall behavior, appearance, and all areas of their playing. Ratings range from 5 to 1 (1 being the best). The concert band received two “1”s and two “2”s with an overall rating of Excellent. The mustang band received a rating of 1 from all 4 judges (unanimous superior). This is the 3rd time in 4 weeks that the mustang band has received this rating, and they are the only band in the district to receive this rating in at least 3 years. 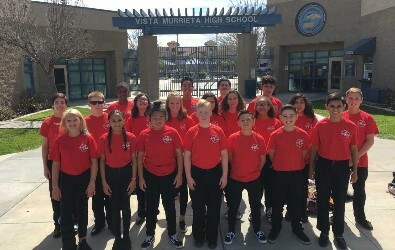 They have been accepted to perform at a regional festival in May. We are so proud of Ms. Lisa Frye for being selected as “Classified Employee of the Year”., both at the District level and for San Bernardino County! Lisa is recognized for her compassion and dedication to every member of the Magnificent Mustang Family through her service as an aide, a substitute custodian, and a club advisor. She is involved with our school and our kids on a daily basis. 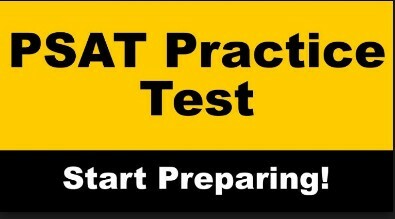 while 7th and 8th grade students win a seat by undergoing a rigorous audition process. These students will perform this Saturday, February 4th, in the University of Redlands Memorial Chapel at 7:00pm. 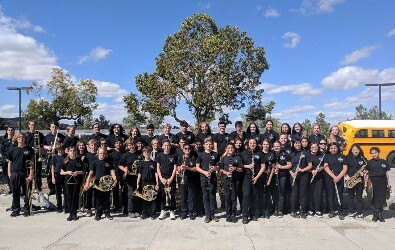 The high school ensemble will also be performing a world premiere of an elegy in honor and reverence of the victims of the 2015 San Bernardino Shooting. Students Pictured: Victor S. Colby C. Diego L. Charlize W. Joshua O. Jasmine Q. Rachael P. Riley B. Sabrina B. Elijah H. Dwayne H. Julian H. Mia M. Yahir R. Maddie P. Alondra A. Bianca O. Alexis M.
On Tuesday, October 18, with perfect weather, students had the opportunity to learn about launching a satellite and tracking the data it provides. 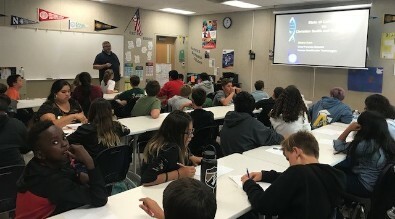 Ted Tagami, CEO of Magnitude.io, the company providing the launch, satellite, recovery, and data gave students an overview of the process at an assembly in the morning. The successful CanSat launch lifted off at 11:20, almost the entire school was there. Mesa View students assisted in getting the weather balloon filled with helium and safely in the air. Seal of Excellence Added to Mesa View! 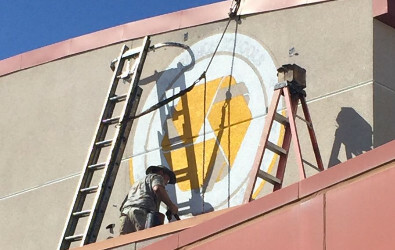 Have you noticed our new emblem on the Administration building? This marks our school as a Gold Ribbon Award School! 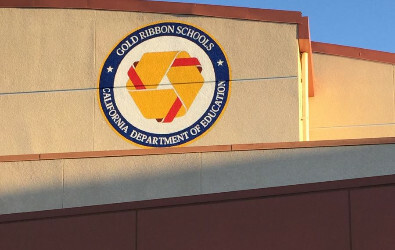 Last spring, State Superintendent of Public Instruction Tom Torlakson awarded Mesa View, one of only 373 secondary schools in California, the new Gold Ribbon School Award. This puts Mesa View in the top 8% of all high schools, junior high schools, and middle schools in the state. This recognition replaces the former "Distinguished School" award and is a prestigious honor. Read the official letter by clicking here. Thank you to our students, parents, and staff who all contributed to earning this award! 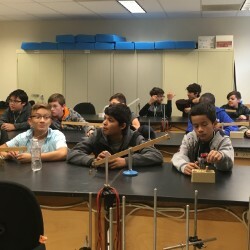 What's STEM really about at Mesa View? Check out the video below or click here. 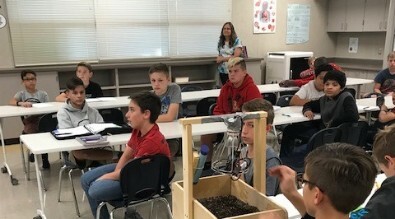 STEM ACADEMY IN THE NEWS! - Second annual Da Vinci Day is a big hit. Click here to read more. - STEM Academy opens in August, 2012. Click here to read the Press-Enterprise story. - Mesa View receives $10,000 STEM grant! Click here for the Press-Enterprise story. - Click here for a Press-Enterprise story on catapult building at Mesa View. - Click here to hear our superintendent talk about Mesa View on radio station Air1. Click the "STEM" link on the left-hand side menu of this webpage or download our STEM Brochure by clicking here. Please e-mail Principal John Moore at john_moore@ycjusd.us if you have questions about our STEM program and/or if you need assistance. 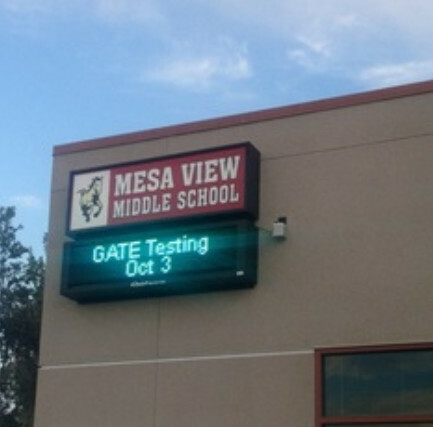 Mesa View's marquee can display your message. Staff, students, and families may purchase appropriate and positive messages (such as birthday greetings, congratulatory remarks, and thank you notes) for the low price of only $20 per week. All proceeds go to support Mesa View field trips. If you'd like to run a message, please contact Mindi Cox at 790-8008 ext. 5274 or at mindi_cox@ycjusd.us. Simplemente haciendo click en las banderas en la parte inferior de la pagina, puede hacer que esta pagina traducida a varios idiomas. Pruepalo! Just by clicking on the flags at the bottom of this page, you can have this page translated into several languages. Try it!